Safety and reliability: The Cradle 'n Swing is Solid and reliable, Prevent sliding and protect baby's back.The maximum carrying 50lb weight. Low voltage power supply in a variety of ways, safe and convenient. 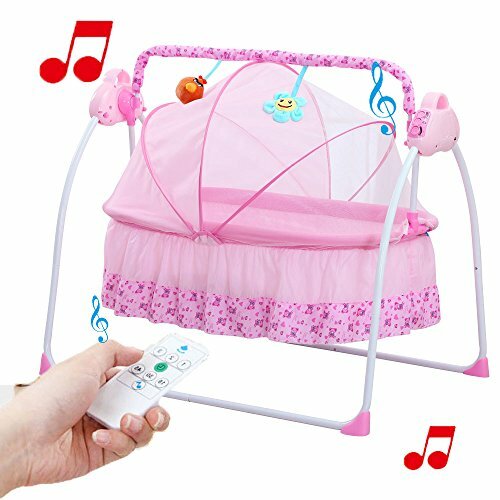 Intelligent & simple control: The control buttons (Swing, music, time buttons) and the remote control on the cradle make the operation simple, even if you are in the 3-5M distance, you can still manipulate it. 3- speed swing allows the baby in the slapstick and sleep when the most comfortable choice, 15,30,45 minutes to automatically stop the timing settings, so that after the baby sleep quiet, energy saving. If you have any questions about this product by Spolor, contact us by completing and submitting the form below. If you are looking for a specif part number, please include it with your message.